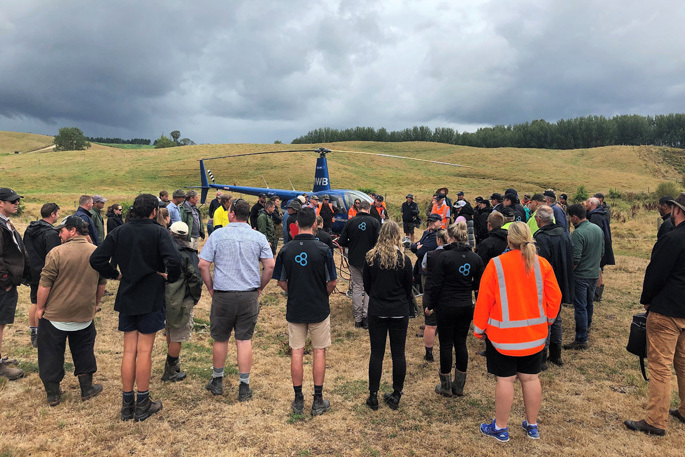 Many rural people came to hear about the trial of ‘no-till’ helicropping showcased in the Southern Waikato last month. A successful trial of ‘no-till’ helicropping showcased in the Southern Waikato last month promises a step-change in the approach to pastoral farming in New Zealand – ensuring the protection of soils while maintaining productivity. “We are effectively putting away the plough,” says Sustainable Helicropping Group chairman Colin Armer. Colin says early results from the $1 million project have proven the potential to address the estimated 192 million tonnes of soil that are lost every year from erosion – according to the Ministry for the Environment’s Our Land 2018 report – 44 per cent of which is from pastoral land. Colin says protecting the soil is a common bond, which originally brought together seven farmers to trial aerial no-till on their rolling hill-country properties across the central and lower North Island. The technique involves precision use of herbicides, fertiliser and seeds applied by helicopter. While especially relevant on hill-country, the practice is cost-effective on the full range of land contour types and – when done correctly – provides a valuable source of feed without the risk of erosion. “Soil is the resource that our farming operations are based on. Soil is not renewable and it must be cared for, so we can pass our farms on to future generations,” says Colin. The potential of the aerial no-till approach is supported by Ballance Agri-Nutrients’ fertiliser and forage specialist, Murray Lane, whose work with the trial is captured in a joint paper on the technique with Bruce Willoughby of Ecometric Consulting to the NZ Grasslands Association Conference. Murray says aerial no-till is a far cry from the old ‘spray and pray’ practices, which delivered patchy results and were unlikely to achieve consistent environmental outcomes. “Today we have GPS-supported precision placement tools available for fertiliser and seed placement, along with sophisticated Accuflow nozzles to confidently spray without drift. “The farmers involved have been achieving profitable returns and aerial no-till also helps them meet their obligations as environmental custodians,” says Murray. Project manager Ian Tarbotton says the priority is establishing what constitutes best practice, in both the establishment and grazing phases of the crop – so the prescribed process delivers results that are environmentally sustainable as well as profitable. “We will be looking at grazing intensity, plant species and the role of soil bunds, vegetative buffer strips and catch crops to minimise the risk of soil loss. We have a lot of interest from regional councils who can see the clear environmental benefits of getting this right. Ian says extension is an important part of this project, which will be delivered through a combination of field visits, a website, hands-on and virtual tools as well a research paper and a farmer handbook. Colin says the long-term goal is “more profitable and resilient farms, especially rolling and hill-country farms, the retention of soil, improved soil condition and matching grazing approaches to forage type and location”. As well as funding from the Government’s Sustainable Farming Fund, the project has been backed by a range of supporters across multiple sectors in north and south islands. Financial support has also been provided from Beef+Lamb NZ, Ballance Agri-Nutrients, Bay of Plenty Regional Council, Nufarm, and suppliers of seed Agricom and PGGWrightson Seeds.